Buy and earn 90 points valued at £0.90. 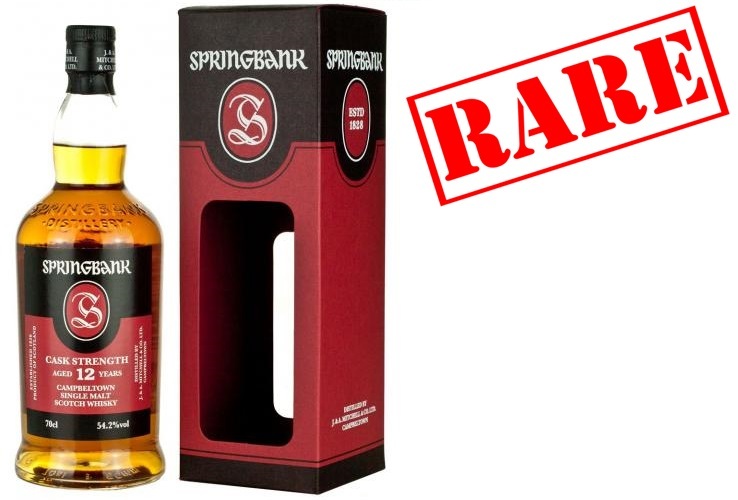 An early release of the amazing Springbank 12 Year Old Cask Release, bottled in January 2017 with an ABV of 54.2%. Produced at Campbeltown's oldest operational distillery, this cask strength 12 year old single malt has been matured in a combination of 70% sherry and 30% bourbon casks before bottling with a limited worldwide amount of bottles available. A stunning and sought after cask strength classic, also a limited bottling so won’t last long! Nose: It's reminiscent of walking in an autumn forest full of pine and chestnut trees, before returning home to the iodine of a Campbeltown malt and ending with a delicate hint of peat. Palate: A gorgeous richness on the palate which is balanced between citrus marmalade on toast and caramelised toasted marshmallows, not forgetting flavours of vanilla and pepper. It’s a lip licking meaty dram. Finish: A delicious, viscous, smooth liquid with a salty edge. It brings back memories of a ham joint which has been marinated in a rich honey sauce and slow baked in the oven.